This stunning space designed by Katie Hodges is as compelling as it is welcoming, and frankly, that kind of finesse is pretty impressive. The green booth is a comfortable space-saver that also lends itself well to the decorative magic that a few well-arranged throw pillows can bring, and the mix of patterns on those fluffy fabrics are just playful enough to keep everything feeling light. Meanwhile, a simple white table adds plenty of practical surface area to the nook, while the globe pendant above illuminates the area and allows for natural light to reflect freely, too. Finally, matching brown leather chairs bring in a minimalist dose of sleek style, as the showstopper of this look — the cowhide rug — gives texture and shape to the floor. And in case you didn't notice, the rug is also a rugged hint at the big-sky artwork on the wall, and we appreciate that simple move to tie the entire room together. 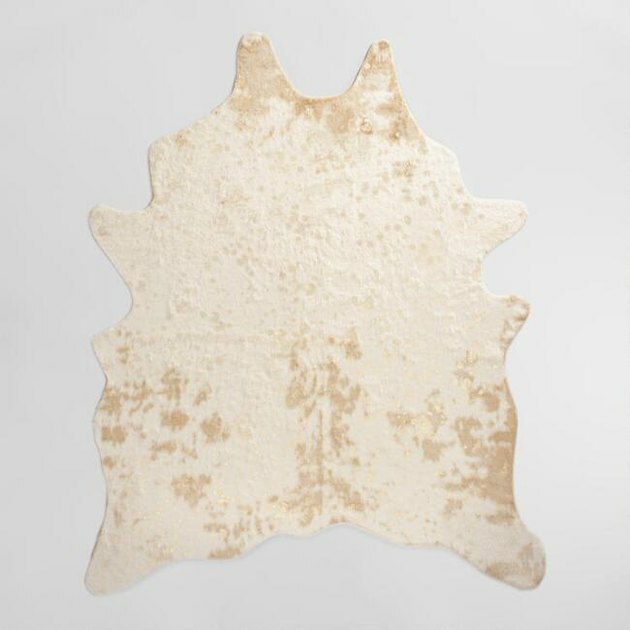 Add some personality to your space with this faux-cowhide rug.